"The Star Spangled Banner" is the title of the National Anthem of the United States of America. The lyrics are based on a poem written in 1814 by Francis Scott Key called "Defence of Fort McHenry". The tune is based on a popular British song. Key wrote his poem after witnessing the bombardment of Fort McHenry by British ships of the Royal Navy in Baltimore Harbor during the War of 1812. "The Star-Spangled Banner" was recognized for official use by the U.S. Navy in 1889 and by President Woodrow Wilson in 1916. It was made the national anthem in 1931 by President Herbert Hoover. Although the poem has four stanzas, only the first is commonly sung today. This patriotic song is sung on national holidays and before sporting events. It is known for being difficult to sing because it has a wide range of pitches. It needs to be started low enough to be able to reach the high notes at the end. Ask a person to name a music composer and they will probably name Beethoven. He is probably the most recognized name in classical music. 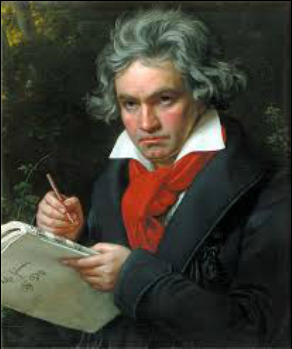 Ludwig van Beethoven [BATE-HOVEN] was a classical pianist, composer and conductor. He is considered the greatest of the three Classical Style composers, along with Haydn and Mozart. Beethoven is considered a musical genius. His famous works include nine symphonies, string quartets, instrumental pieces, and works for piano solo and piano with orchestra. Beethoven is important because his style of composing influenced the musicians who followed in the Romantic period of the 19th century. 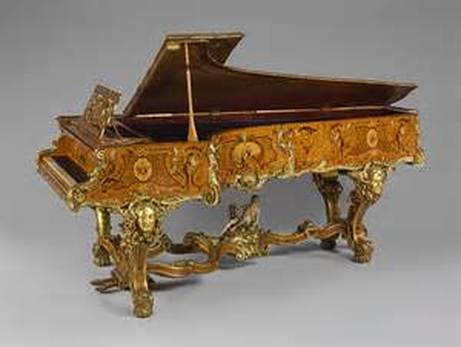 The Classical Style lasted from about 1750 to 1830. This was during the time that our country was gaining independence from England, and George Washington was becoming our first president. Characteristics of this style were music that sounds elegant, graceful and controlled. But Beethoven took his music to another level. His music displayed more emotion and power, with greater contrasts than the music of Haydn and Mozart. Louds were now louder and softs were softer. The mood changes found within his symphonies evoke a sense of an "emotional roller coaster". His music brought new energy and excitement to his audiences. Today's listening example is from Beethoven's famous Symphony No. 5. A symphony is a large work for an orchestra to play, lasting about twenty minutes. It has four short sections called movements. We're going to listen to part of the first movement because this is the one that most people recognize. The beginning of Beethoven's popular and well-known 5th Symphony is not so much a melody, but rather a rhythm pattern of three short, repeated notes followed by one longer note. The first movement of the symphony is based on this theme. Listen for types of contrast in the music. The power and energy in this music reflects Beethoven's forceful personality. Music Listening Example: "Fur Elise"
One of Beethoven's most popular compositions written for piano is Fur Elise, which in English means "For Elise." 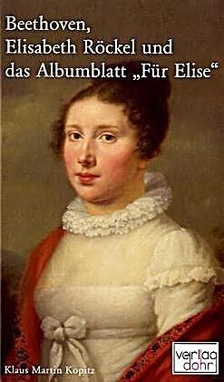 There has been speculation among music historians as to who Elise really was. At least two of his friends and piano students have been suggested as the person to whom the piece was dedicated. This work is usually classified as a bagatelle and is written in the key of A Minor. It was written in 1810, but the music score was not published until 1867, 40 years after the composer's death. The famous melody begins with two music tones alternating back and forth in the right hand. The left hand plays an accompaniment of broken, or rolled, chords called arpeggios. The minor key gives the music a hint of mystery. The gently flowing rhythm is calm and graceful. 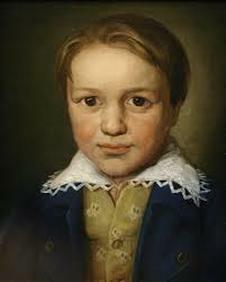 Beethoven was born in the village of Bonn in Germany into a family of musicians. He later moved to Vienna, Austria where he spent the rest of his life. 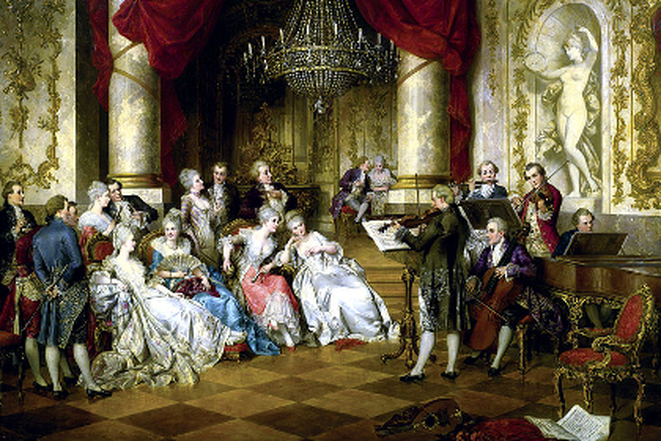 During Beethoven's lifetime, Vienna was the musical capital of Europe. It was there that he met Franz Joseph Haydn and Wolfgang Amadeus Mozart, classical composers who instructed and influenced Beethoven. 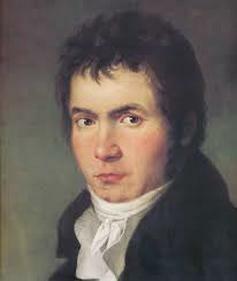 At the age of 16, Beethoven played the piano for Mozart, who predicted that the young man "would one day give the world something to talk about". Mozart's prediction certainly came true! Vienna was a music-loving city dazzled by Beethoven's piano virtuosity and his ability to improvise music. His first years in Vienna brought hard work, growing confidence and public praise. In fact, three noblemen committed themselves to give him an annual income on the condition that he stayed in Vienna. This was something new and different in the musical world. 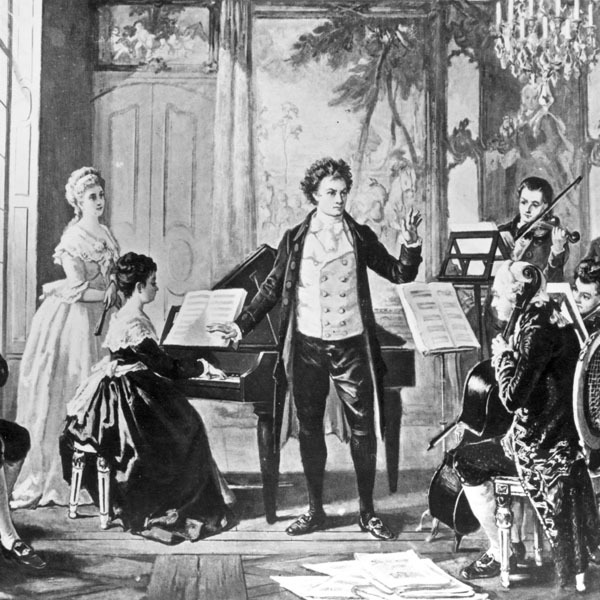 Beethoven was the first major composer who was never in the service of the aristocracy. Beethoven with the Razowmusky Quartet by Borkmann. 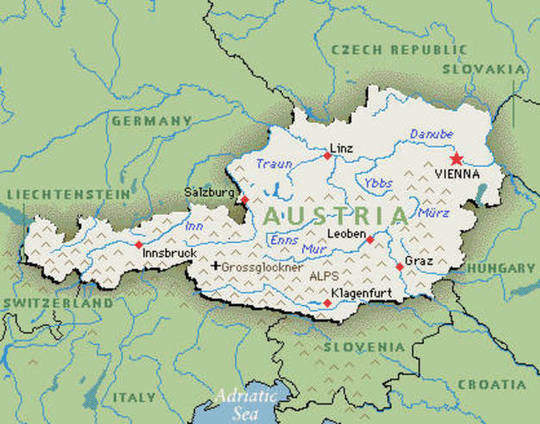 Map of Austria Salzburg is on the central west border. Vienna is in the northeast part of the country. In his 9th Symphony, Beethoven did something new. For the final movement, he had a huge choir and four soloists sing along with the orchestra to make the music sound even more grand and glorious. This portion of the music is known as "Ode to Joy" based on a poem by the German poet and historian, Friedrich Schiller. It is commonly known as a hymn called "Joyful, Joyful, We Adore Thee". 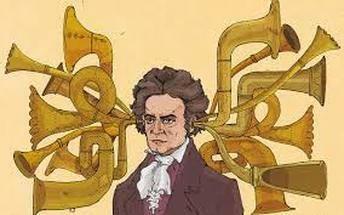 By the time Beethoven was 29, he had begun experiencing a hearing loss. It was frustrating and caused him to not enjoy conversing with others. Beethoven enjoyed walking in the countryside, and he carried small notebooks and a pencil with him so people could communicate with him. 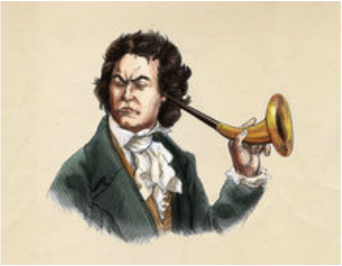 He also used an ear trumpet, a bell-shaped device he could hold to his ear to help him hear. He would eventually go completely deaf. By the time he completed his ninth and final symphony, he was completely deaf! But his disability did not stop him from doing what he loved because he could hear the music inside his head. Beethoven's Piano Sonata No. 14 in C-sharp minor is commonly known as the Moonlight Sonata. 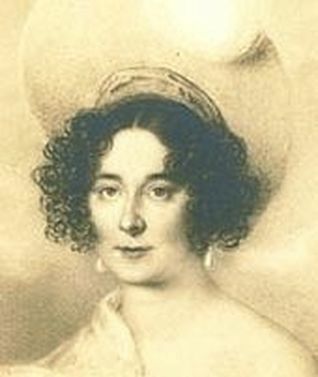 Written in 1801, Beethoven dedicated it to his pupil, Countess Giulietta Guicciardi. This piano sonata is one of his most popular compositions for the piano. A German music critic once compared it to the effect of moonlight shining on a lake at night. The melody is woven into a persistent triplet rhythm played by the right hand on the piano while the left hand plays a slow moving bass line. The music is slow and sustained, and very quiet throughout. Beethoven's student Carl Czerny called it "a nocturnal scene, in which a mournful ghostly voice sounds from the distance". This music was very popular in Beethoven's day. As Beethoven's hearing weakened, this once brilliant pianist was forced to stop performing in public, but he insisted on conducting his orchestral works long after he could do it efficiently. His sense of isolation grew with his deafness. Despite this, and personal problems, Beethoven had a creative outburst after 1818 that produced some of his greatest works. These include piano sonatas and string quartets, a Mass for orchestra and choir, and his Ninth Symphony. Beethoven's string quartets follow a form established by his former tutor, Haydn. Haydn had needed some music when most of his orchestra was on summer vacation, so he wrote a composition in the same form as a symphony, but for only four instruments: 2 violins, 1 viola and 1 cello. This became known as a string quartet. One of Beethoven's most popular quartets is in C Minor, Opus 18, No. 4. 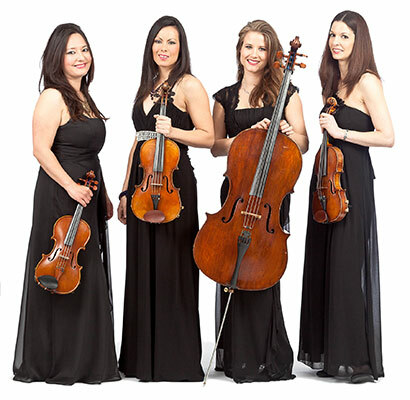 The final movement of this string quartet is a spicy rondo based on a "gypsy" flavored refrain. A rondo is a music form with different sounding sections and a refrain that keeps returning. The main theme is lively, pleasing and simple to remember, and the listener can easily recognize its return. The sections in Beethoven's rondo are labeled A-B-A-C-A B-A. Can you hear when the sections change? The harmony shifts back and forth between a more serious sounding minor key and a playful sounding major key. Listen for the humorous ending.